Need a secure place to advertise your higher-priced, upscale materials and keep it dust free? 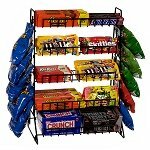 Lock it up and keep it safe with this 3 Shelf Acrylic Counter-top Showcase Display! Our enclosed exhibit is the perfect way to highlight your products of various types and styles. Made of crystal clear acrylic materials and the construction allows for fabulous visibility so your patrons and look with ease and have optimal viewing. The shelving is at a fixed setting but offers ample room with just under four inches of space in between each shelf. The locking doors on this counter top display fixture keeps your items safe and secure. This three shelf showcase is great for exhibiting jewelry, sunglasses, watches, electronics, games and accessories plus so much more. Two keys are included for your convenience. 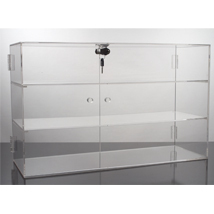 Add this lockable acrylic display to your cart and purchase yours now!